by Ambular Posted 28th Nov 2008 at 4:16 PM - Updated 14th Mar 2009 at 1:45 AM by AmberDiceless : Server asplodied! Fixed files. When I was a little girl, I had a lovely single bed and dresser made by Ethan Allen that had belonged to my grandmother. When I got older, my parents found a matching bed and nightstand to add to the set. The nightstand was lost in a move, but my daughter now sleeps in one of the beds and I still use the dresser. I've been unable to find a similar set for The Sims 2, so I've spent the past three months creating a full bedroom set based on my beloved furniture. 1/14/09: If you have experienced the 'Exploding bedding' bug with the beddings from this set, or if the beddings have just shown up as solid white for you, please try replacing them with the alternative versions I have added and let me know whether this fixes the problem. I cannot reproduce the problem and have no way to test them myself, so I am counting on downloaders to let me know! If you have not experienced this bug, there is no need to download the 'NoShine' beddings. - Single Bed <-- Comfort rating 7, Energy 6 (for real!!) This is a repository object and is required for the set to function! To recolor the primary wood texture for the set, recolor this object. - Low Dresser - Plain <-- This object can be used alone or with either of the wall mirrors. If the mirror is set against a wall, the moveObjects cheat is not needed. Otherwise you must turn the cheat on to position the mirror on the dresser. - Wall Mirror <-- This is a repository object and is required for the trim on all the mirrors and pictures in the set to function! To recolor the trim on the mirrors and pictures, recolor this item. - Wall Mirror Plain <--This is included for the sake of completeness. The dresser I actually own has a mirror like this one. - Painting <-- Designed to hang over the double bed. - Table Lamp <-- Sits on all the dressers and the vanity as well as the nightstand! - Headboard Lamps (L and R) <-- Can be placed on either bed for reading! - Decorative Huggy Bear, Picture Frame and OCR Ribbons Bowl <-- Just a few random shinies to put in those nifty slots. Also included are ten or so recolors of the various items in the set, three bedding recolors based on bedding I own (curtains will also pick up the textures!) and a collection file, which should be placed in your Collections folder. All files have been squished with jfade's Compressorizer. - The entire set should work with any EP from Pets through Apartment Life. - Table lamp, double curtains and headboard lamps require NL or higher. - The two low dressers require OFB or higher. - The vanity requires at least one EP installed. IMPORTANT: If you do not have Pets or a later EP installed, you must use the base-game versions of the beds and mirrors included in the separate .rar file. USE ONLY ONE VERSION OF EACH OBJECT. Poly Counts: Due to the large number of curved surfaces, several of these meshes (particularly the single bed) are fairly high-poly objects. Please forgive; I did try to keep them down as much as possible without losing an unacceptable amount of detail. - The Single Bed and Wall Mirror (the decorated, not the plain one) are both repository objects and are needed in order to recolor the other objects AND for the rest of the set to function! - Due to inherent Maxis limitations, the painting, the photo and the vanity stool cushion *can* be recolored, but in order to do so you must make a full recolor of the single bed texture. - The table and ceiling lamps, the teddy bear and the decorative bowl are independently recolorable. 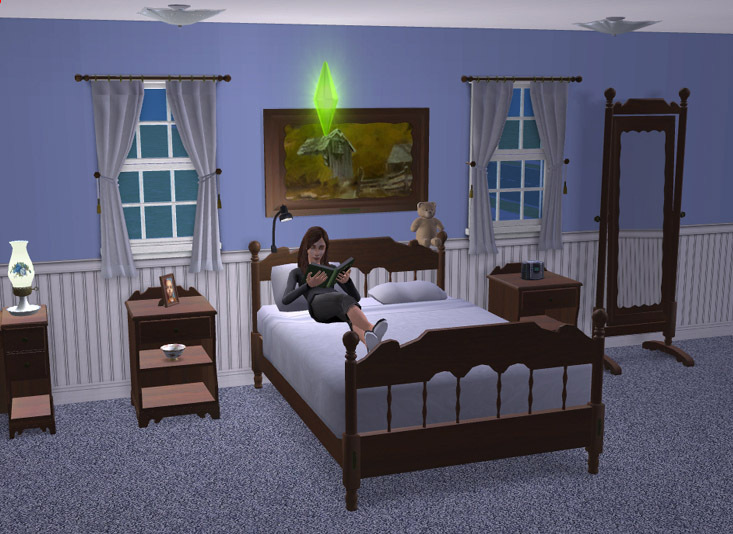 - Headboard lamps draw their recolors from the Maxis "Watt Is This" table lamp and will pick up any recolors of that lamp. - The curtain fabric and ties draw their textures from the Colonial Ironwood Bed (the standard Maxis bedding) and the curtain rod and tassles, from the Cornerstone Victoriana Velvet Drapes. The curtains will pick up recolors of either of these items. 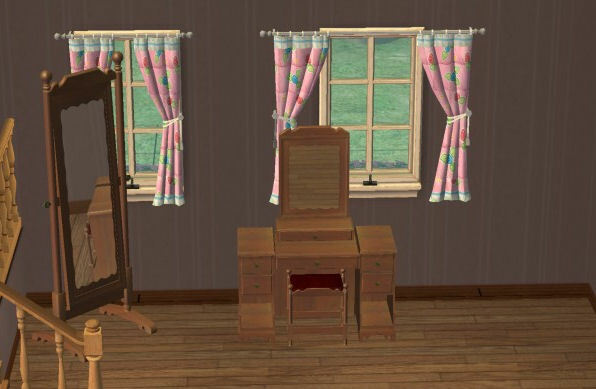 - Thanks once again to the help of the generous and talented Lord Darcy (http://modthesims2.com/member.php?u=159869), all three dressers in the set have three fully-functional slots on top. Thank you Lord Darcy, you're my hero! - Nightstand now includes three slots. - Headboards on both beds include two slots each. - The animations on the dressers do not closely match the handles; if anyone knows how to fix this and would like to take a stab at it, please do! I'd be very glad to give you credit and a link to your site or profile. - When using a wall mirror with the low dresser, there is very slight clippage when using the 'Gussy Up' interaction. Not too noticeable. - Slight problem with the drawer shadow on the fancy low dresser. Not sure how to fix this; any advice would be appreciated. - Minor glitch with the vanity mirror reflection when viewed diagonally from the far left or right. - Recolor all you like, using my textures or your own; just please do keep it tasteful. Credit and a link would be appreciated. - I welcome any helpful additions, fixes or enhacements from other modders and would happily share credit, but please upload them to this thread and none other. - Please don't upload my work anywhere else without my permission. - Do not upload recolors to pay sites. Special thanks to Lord Darcy for enabling the slots in several of these objects, providing the base game compatible versions and fixing an assortment of minor issues I never would have caught. Thanks also to all the incredibly talented people who have written tutorials for object creation and modding here on MTS2 or kindly shared their expertise with me while I worked on this set. These recolours may or may not be endorsed by Ambular.